As a new school year begins, so does a new chapter for The Catholic University of America. Beginning this past spring semester and throughout the summer, construction crews have been hard at work renovating and taking up space on campus. The first project, known as the University Energy Project began in the beginning of November 2017. 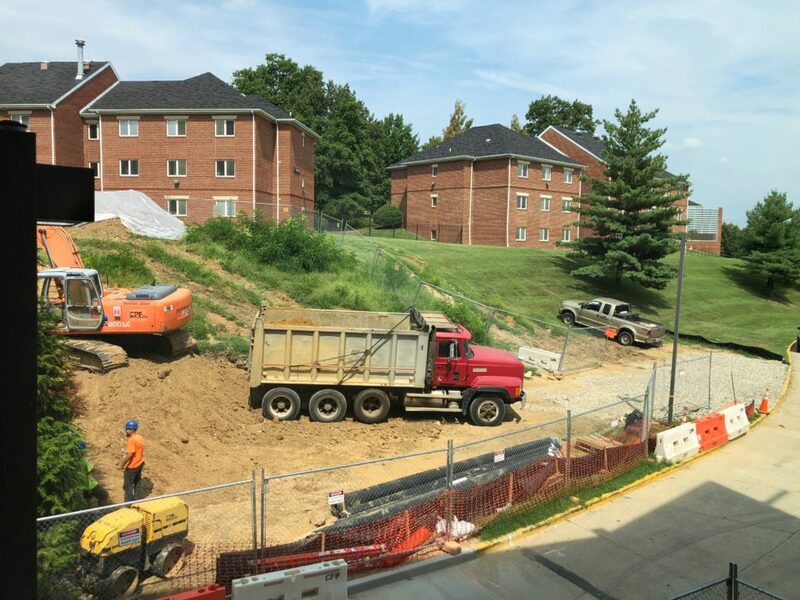 The construction for the Energy Project is currently taking place between Pangborn, Gowan and McCort-Ward Hall where new pipes are being installed. This new piping will provide university buildings with improved hot and cold water distribution. Once this project is completed the road between these buildings will no longer be for vehicle traffic, but instead will become a new entrance pedestrian walkway onto campus. “The new paving design is quite beautiful and will greatly enhance the pedestrian entrance to campus from the Metro,” said Debra Naute-Rodriguez, Associate Vice President for Facilities, Planning and Management University Architect. Naute-Rodriguez was appointed by University President John Garvey and took over the post in July 2018. The university’s Energy Project is still under construction, closing several walkways and roads throughout campus, and is expected to be completed early in the Spring 2019 semester. Areas affected by construction include the Pangborn Parking Lot, the road between Pangborn, Gowan and McCort Ward Hall, Crough Alley, and Mullen Road (located between the Library and Crough Architecture Building). Also opening in the beginning of the Spring 2019 semester is Maloney Hall, the new home of Catholic’s Busch School of Business. Maloney Hall has been under construction since Fall 2017. Prior to being the home of the Business School, it was home of the chemistry laboratories on campus. Other projects scheduled by the university include the new dining hall that was announced last year which is scheduled to open in 2020, as well as a new residence hall. This new residence hall is, “currently being discussed for its location behind Reagan and Ryan [Halls],” said Tim Carney, Executive Director of Housing, Recreational Sports and Fitness, Transportation and Parking. It will provide more housing for students in the future which is important because the university increased the requirement of time living on campus from two years to three years. The university does plan to keep current residence communities such as Centennial Village in use even after the new residence hall opens to continue to accommodate all students. It is uncertain exactly which buildings will remain open in the long term with the construction of the new dining hall. When asked about what the university would look like in five years to those who either are graduating this year or last spring, both Carney and Nauta-Rodriguez echoed that there will be many changes including the new dining hall as well as the new residence hall and revamped campus centers and academic facilities. “I believe [students] will see the constructed results of many of our plans and designs that are just on paper right now,” Nauta-Rodriguez said.